Dwarf boxwood shrubs often are used in formal landscape design. As dwarf plants, they are compact in size; as boxwoods, they bear dense, attractive foliage and are amenable to trimming. This combination of qualities makes them a solid choice for short, formal hedges. Extend a tape measure along the ground in the desired location for hedge. Plan to space the plants about 12 to 24 inches apart (measuring from center to center), depending on the mature size of the shrub. 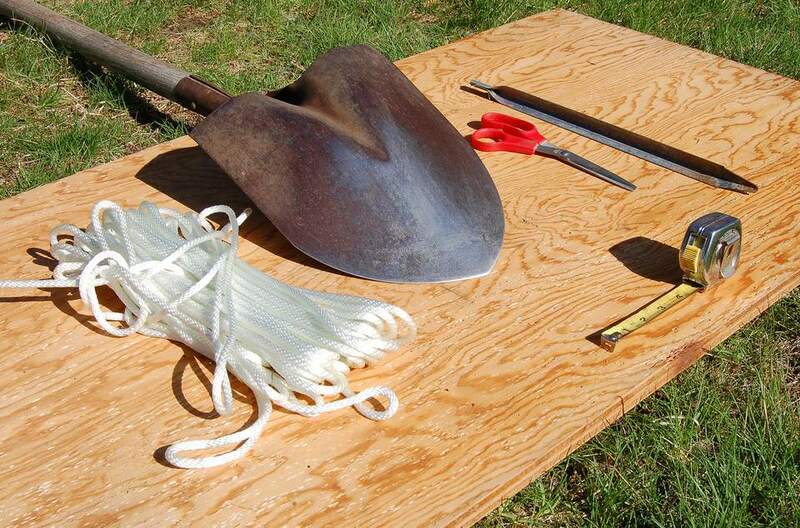 Drive a stake to mark each end of the trench, then tie a string from one stake to the other, pulling it taut. If desired, spray a line of spray paint under the line to mark the ground. Remove the sod under the guide string, using a shovel, forming a shallow trench about 2 feet wide. Cut out the sod out in chunks about 4 inches deep by about 10 by 10 inches. Lift each chunk and pound it with the shovel to knock off as soil as possible so that it is not wasted. Dispose of the sod by placing it in a compost bin. If the soil in this area needs aeration, add peat moss and mix it into the soil. Find the width of the root ball of your plants by measuring across the top of the pot (with small, container-grown shrubs, the root ball usually fills the container). Find the height of the root ball by measuring the height of the pot and subtracting for any empty space at the top of the pot. The holes you dig should be twice the width of the root ball and not quite as deep as the height of the root ball (so the top of the root ball is not covered). Dig each hole according to the root ball dimensions. The hole should measure twice the width of the shrub's root ball and not quite as deep. This will provide the roots plenty of room to expand sideways, through freshly-laid, rich soil. For example, if the root balls are 6 inches wide, make the holes 12 inches in diameter. Space the holes according to your layout, and remember to measure between the centers of the holes (where the plants will be centered), not between the edges of the holes. Before planting a container-grown shrub, gently knock it out of its pot and check to see if it has become root bound. This means that a thick mat of roots has built up on the outside of the root ball, due to the unnatural constraints imposed by the container. As a result, the roots can't pass nutrients to the shrub. If you plant the shrub in this state, the roots may not break free of this unnatural growing pattern. To free the roots, "tease" them: loosen the outer roots of the root ball so that once you place the plant in the ground, the roots can resume normal growth patterns. Run a sharp object, such as scissors, along the exterior of the root ball wherever matting has occurred. The sharp object will slice through the matted areas, freeing the roots to grow naturally. Do not worry about damaging the matted roots; they are useless in their current state. Set each boxwood shrub in the middle of its planting hole and begin to fill dirt in around it. To fill the hole, mix the soil you removed with soil amendments, such as compost. The important issue here is how the soil will settle, or compact after air pockets work their way out. Excessive settling will leave a donut-shaped depression around the plant. To remove air pockets, tamp down the soil as you place the plant in the hole and water the soil lightly. After filling the hole, the root ball should protrude slightly above ground level to promote good drainage. If you dig the planting hole too deep, the base of the shrub's trunk might end up below ground level after the soil settles, resulting in poor drainage, which can lead to plant diseases. Add mulch to the planted area. 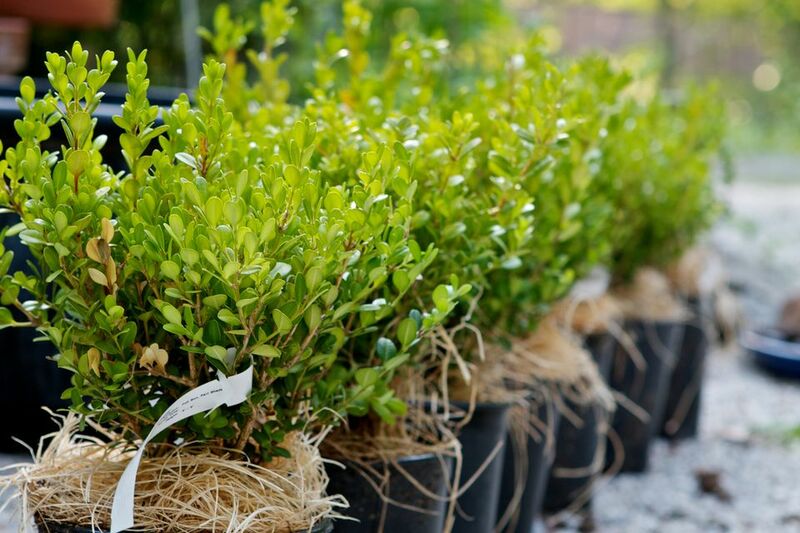 Boxwood shrubs have shallow roots, and mulching helps to protect the roots from the sun. It also inhibits weed growth and helps to retain moisture in the soil. Apply only 2 to 3 inches of mulch, and leave 1 inch or so around the base of each shrub without mulch to promote air circulation. Using more than 2 or 3 inches of mulch will cause the boxwoods to produce shallow roots instead of growing deeper into the soil. This will cause the shrubs to become more susceptible to damage during periods of drought.